Maybe you missed the headlines July 24, when Nature ran a commentary warning that a 50-billion-ton burst of methane from the East Siberian Sea would boost global warming enough to cost world economies $60 trillion — about the world’s one-year gross economic output. Methane packs a hothouse punch: gram for gram, it produces about 25 times as much warming as carbon dioxide. And so that methane “burp” — from an Arctic Ocean backwater — could spike planetary temperatures by 0.6°C. 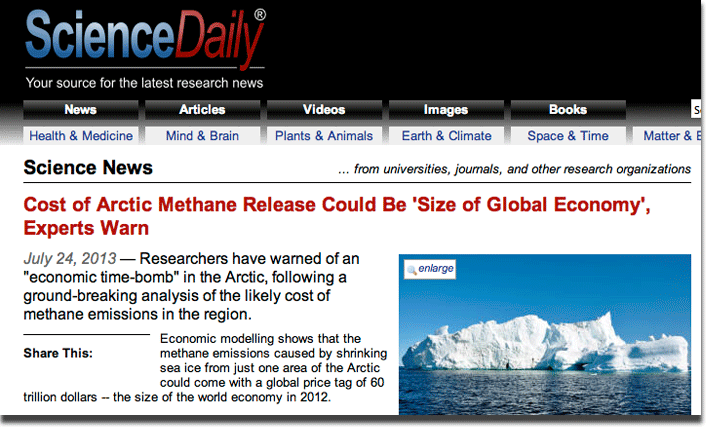 Headlines like this aroused concern that a “methane time bomb” might set off an explosive, expensive climate warming. How probable is a catastrophic release of methane from the thawing North? The commentary raised a roiling row among scientists — we promise to return to it shortly — and it got us thinking about carbon releases and global warming in the North, scene of the fastest warming on the globe. By itself, permafrost, land that never completely thaws, covers 24 percent of the Northern hemisphere land surface, and recent measurements show rapid thawing in some areas, together with bubbling streams of methane and releases of carbon dioxide. This huge area stores vast amounts of carbon, which can be converted into carbon dioxide or methane. Offshore, colossal stores of methane hydrate, a frozen cage holding natural gas molecules, can break down in a warming sea. Submarine hydrates have been found at 40 sites globally. 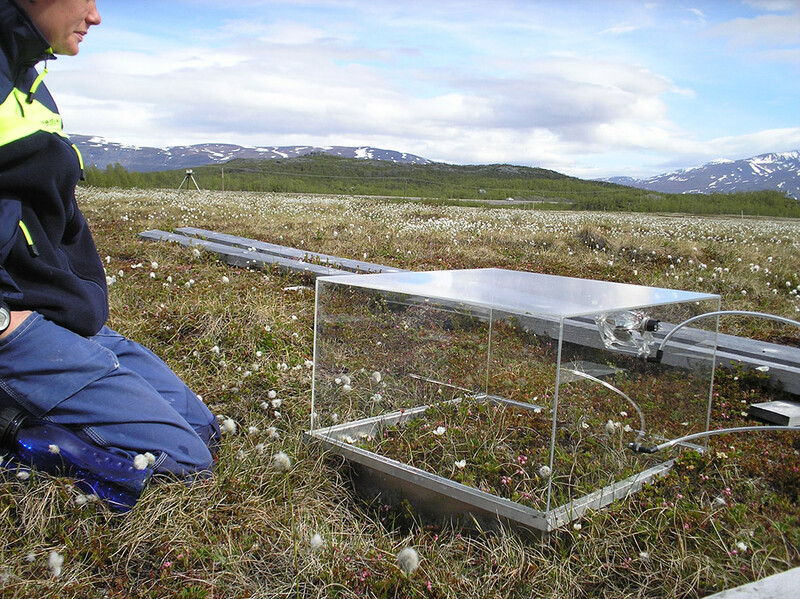 Scientists trying to get a picture of greenhouse-gas production in the Arctic used this chamber to trap methane and carbon dioxide at the Storflaket peat bog near Abisko, northern Sweden. In March, Japan was the first to extract methane hydrate from an offshore well. Greenhouse gases from the Arctic are likely to cause much less warming than burning fossil fuels and obliterating temperate and tropical forests. But if the Arctic dump of greenhouse gas is big enough, it could stimulate more warming that releases more gas that causes more warming. Such a runaway warming is a nightmare scenario that could lead to uncontrollable warming. But with so many moving parts, it is extremely difficult to study. What do we know about the release of carbon dioxide and especially methane from the Arctic? Are the rates going up? Let’s return to our “news hook” — the July Nature commentary by Gail Whiteman of Erasmus University in the Netherlands. The study figured the economic cost of warming that would result if 50 billion tons of methane entered the atmosphere from the East Siberian Sea over 10 years and raised the average global temperature 0.6°C. Due mainly to sea level rise, the hefty price tag — $60 trillion (with a “t”) — would be paid by mostly by poor countries in Africa, Asia and South America. 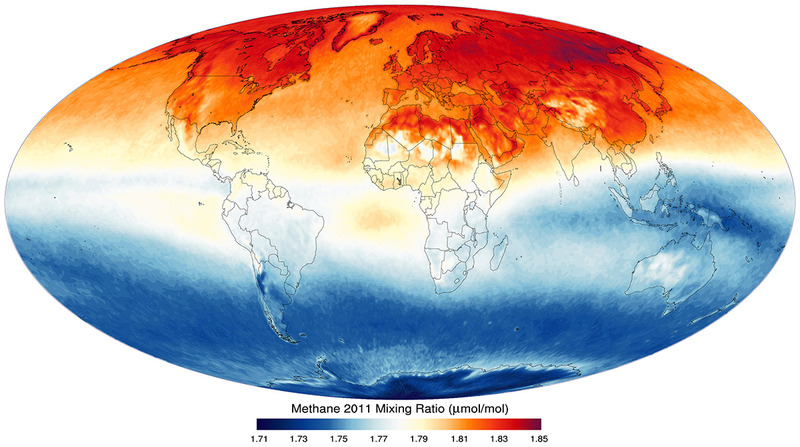 Map shows the ratio of methane, based on molecules per unit volume. How likely is an unaffordable and catastrophic “methane bomb”? 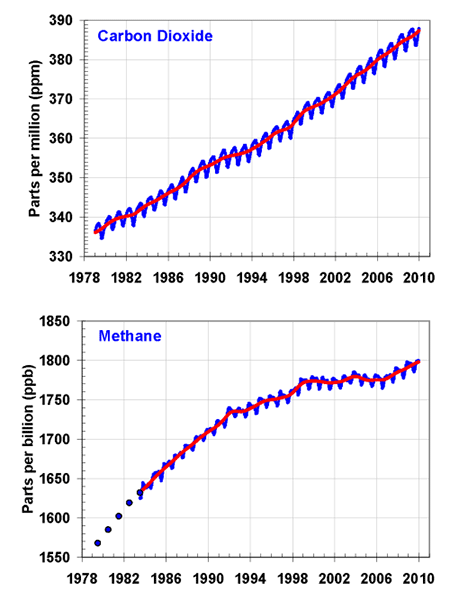 When measured against the 600 million tons of methane entering the atmosphere each year, 5 billion tons a year is huge. And although methane oxidizes within seven years in the atmosphere, atmospheric concentrations have been rising for decades. 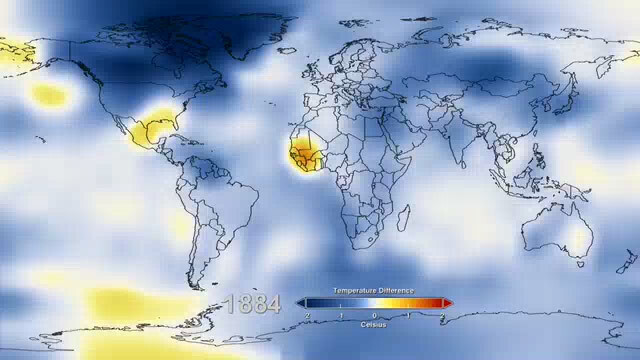 This color-coded map shows anomalies in global surface temperatures from 1880 through 2012. Global surface temperature in 2012 was +0.55°C, but warming was much greater in the North, as predicted by early computer models. Red: abnormally high temperatures; blue: abnormally low temperatures. All comparisons are to the average between 1951 and 1980. $60 trillion = big bucks! 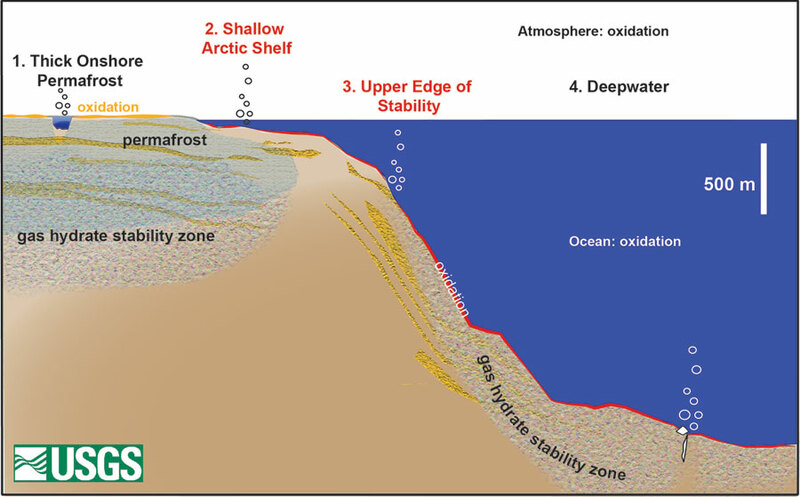 Methane hydrate (“gas hydrate”) in high latitudes exists in permafrost, and hydrate stability zones that are governed by pressure and temperature. Climate is changing both factors, and more methane is likely to reach the atmosphere. Want more on the methane bomb? Methane hydrates, a frozen cage holding methane molecules, require a specific range of temperatures and pressures that exist in the “hydrate stability zone.” In a recent study1, Stephen Hunter, of the School of Earth and Environment at the University of Leeds (United Kingdom) looked at changes in the stability zone after expected rises in sea level and ocean temperature. Carbon dioxide and methane have been rising fast since 1978, amid growing concern about greenhouse warming. Hunter’s calculations balanced warming of the bottom water, which can thaw hydrate, against higher pressure due to rising sea level, which enhances hydrate stability. He found about a 0.04 percent shrinkage in volume by 2100. That sounds trivial, but since these stability zones hold an estimated 500 billion to 3 trillion tons of methane hydrate, that means hydrates are adding to about 1 million tons of methane to the atmosphere each year. But it’s not really that simple, since methane can oxidize into carbon dioxide while rising through soil or water. Hunter adds that the certainty of his estimate is unknown, and that it ignores methane trapped in subsea permafrost, which is exactly the source at issue in the East Siberian Sea. Landward, ho! A sink, then a source? You might think the situation on land, where permafrost also stores methane and releases methane and carbon dioxide, would be easier to study, but the permafrost region is vast, distances are long, mosquitoes are ferocious, and doing anything there is incredibly expensive. The permafrost region encircling the North Pole stores a staggering 1.7 trillion tons of carbon — more than twice what’s in the atmosphere, and its fate matters. On land, soil and vegetation can play opposite roles in the carbon budget. Rising atmospheric carbon dioxide accelerates plant growth, removing carbon from the air, but warming increases microbial action, which releases methane and carbon dioxide. And so the warming-induced loss of carbon from the surface soil “is almost balanced out by vegetative carbon increase from better growing conditions,” says Charles Koven of Lawrence Berkeley Laboratory2. Although near-term plant growth will outweigh the loss of permafrost carbon, soil contains vastly more carbon than plants, and so in the long term, Koven says, “with more warming, we expect permafrost carbon to play a stronger role, and northern lands will shift from absorbing carbon dioxide to releasing greenhouse gases later this century. 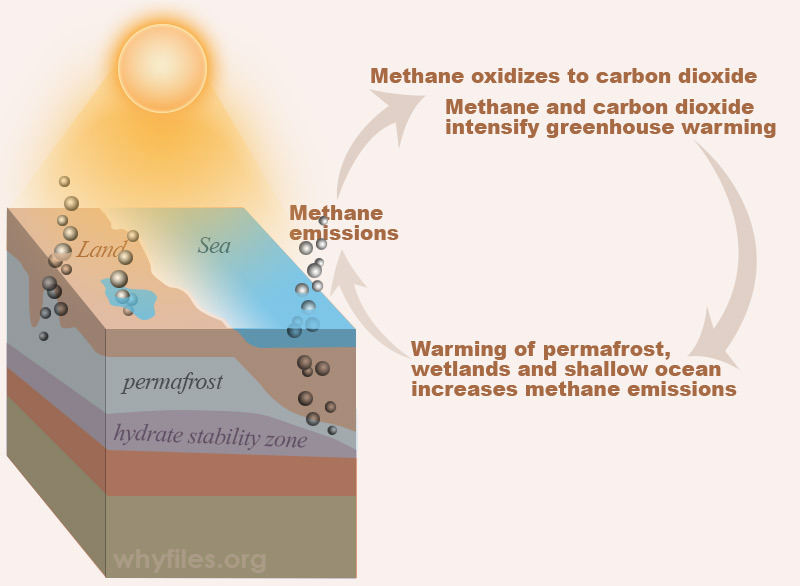 In positive feedback, cause and effect are caught in a vicious cycle: methane and/or carbon dioxide are released from permafrost, lakes and shallow seas. These gases trap heat, which warms the climate. Higher temperatures liberate more methane gas, causing more warming. Edward Schuur, professor of biology at the University of Florida in Gainesville, surveyed a group of experts on Arctic warming issues to predict carbon releases in terms of “CO2 equivalents,” which translates the warming impact of methane in terms of carbon dioxide. The experts said that, in the highest warming scenario, permafrost would release a total of 19 to 45 billion tons of carbon dioxide by 2040 and 162 to 288 billion tons by 21003. The larger estimates also reflect a better picture of how permafrost thaws. “It’s not only about the temperature, but there are all sorts of changes to the ecosystem,” says Schuur. “When the permafrost thaws, the ecosystem can collapse, so releases can happen much faster.” Warming also speeds the growth of microbes that consume carbon and produce methane or carbon dioxide. This “drunken forest” collapsed as permafrost thawed, causing dramatic alterations in the landscape through mudslides and formation of flat-bottomed valleys and thaw ponds, which can enhance the release of methane. 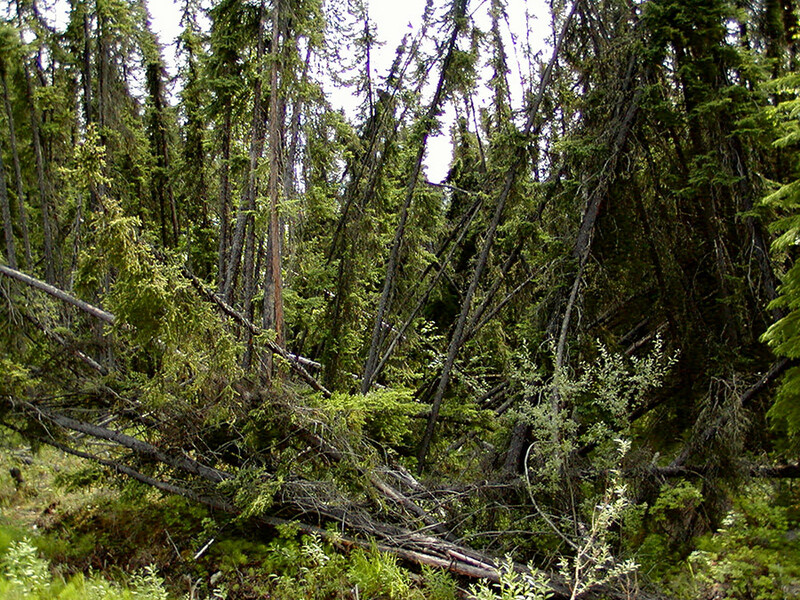 According to the photographer, drunken forests are common throughout the Alaskan interior.